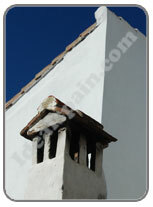 Alpandiere is a small white village (Pueblo Blanco) in the province of Malaga and the region of Andalucia. The village of Alpandiere sits on the southern side of the Genal Valley, close to the source of the River Genal. It is one of a series of small, white villages in the area and covers just over 30 square kilometres. It has a population of just over 300 but even this is declining. The village has a Moorish history although prehistoric dolmens remain nearby, illustrating the long history of the area. The video show the village cooperative where they are processing the chestnuts (November). We then take a walk round the village and the church. Alpandiere is dominated by the church in the centre. The Jesuit church has two towers and is dedicated to San Antonio de Padua. It's also known locally as the Cathedral of the Serrania due to its size. Alpandiere is the birthplace of a bearded monk, known later as Fray Leopold de Alpandeire. Born on 24 June 1866 and baptised as Francisco Tomas Marquez Sanchez, he became a local celebrity at the start of the 19th century. 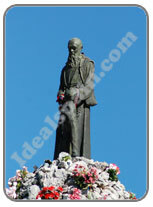 At the age of 33 he left the village to become a Capuchin monk in Granada, where he remained until he died in 1956. His good work has attracted a number of miracles and his tomb is regularly visited by believers in search of divine help. As you drive towards the village you will see a monument dedicated to him. There's also a statue of him sitting in the village. The village of Alpandiere makes for a wonderful visit. If the weather is not too hot, it's a pleasure to wander through the narrow streets. There are a couple of small bars where you will receive a warm welcome, cheap drinks and a splendid local menu. You will notice that within the village, there are lots of natural springs and wells, for Alpandiere has an abundance of fresh spring water. There is limited parking in the village, near the church but you are better off parking at the top of the village and walking down the steep hill. Idealspain toured Alpandiere in November 2010.